Description: The Ann Arbor/Ypsilanti Area Carillon Women’s Chorale and Founding Director, Karen S. Nevins, will perform their Spring Memorial Concert on Wednesday, May 25th at 7:30 pm at St Joseph Catholic (Country) Church north of Dexter, MI. 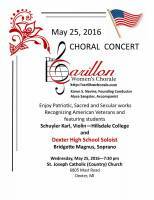 The Chorale will pay tribute to American Veterans and will feature two student soloists with a variety of patriotic, sacred and secular music. A free will offering will be accepted. 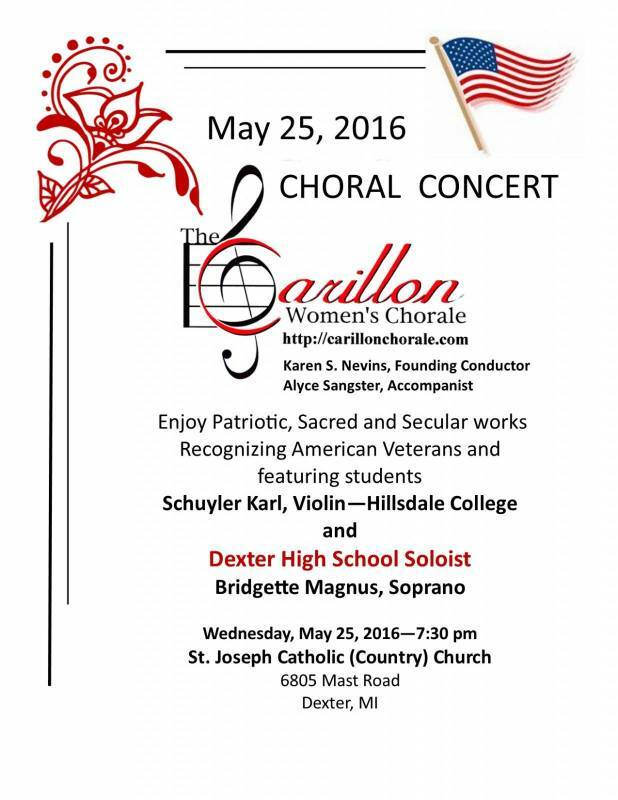 Featured student soloists: Dexter HS Bridgette Magnus, soprano; and Schuyler Karl, violin (Hillsdale College). Alyce Sangster, accompanist. Dexter VFW Auxiliary color guard.